A lot has been written on the subject of test driven development, and especially on the idea that tests ought to be written first. This is an ideal that I strive for, however, I have a tendency to write the unit tests afterwards. Some people learn better by example. This article, rather than going in to great length about the principles of test driven development, will walk the reader through the process of building and testing an algorithm by writing the tests first, then changing the method being tested so that it fulfils the tests. The final code and all the unit tests can be found in the accompanying download. This will require NUnit and Visual Studio 2005. I once saw a demo of how to create unit tests up front for a simple method. The method took a positive integer and turned it into roman numerals. So, I’m going to do something similar. I’m going to take an integer and turn it into words, in English. The rules for this may change depending on the language, so if English is not your only language, you may like to try to repeat this exercise in another language. So, if the integer is 1, the result will be "one". If the integer is 23 the result will be "twenty three" and so on. Also note, I’ll be using British or Commonwealth English. So, for 101 the result in words is "one hundred and one". In American English it would be "one hundred one"
The algorithm will also be refined through refactoring techniques. Agile development methodologies, especially eXtreme Programming, suggests that you do the simplest thing possible to get the thing working. So, going by this premise, I’ll work on the solution in bits. First, get it to return "one", then "one" or "two" depending on the input, and so on. Once 21 is reached it should become obvious where some refactoring can take place and so on. The final solution will work for 32 bit integers only. 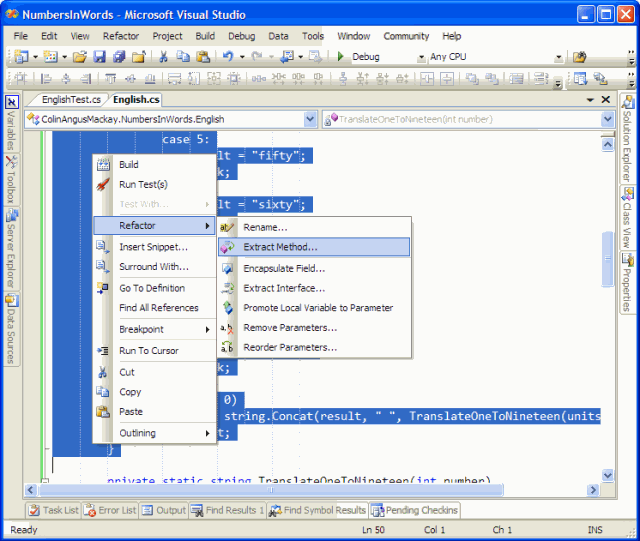 Visual Studio 2005 has some features that can help with writing the tests first. A test can be written that calls into the class under test and the smart tags will prompt you with an offer to create the message stub for you. The test should fail because the stub throws an exception, rather than do what the test expects. NUnit reports the error like this: "NumbersInWords.Test.EnglishTest.NumberToEnglishShouldReturnOne : System.Exception : The method or operation is not implemented.". At this point the unit tests are re-run and they all work out. Expected the result to be "two"
String lengths are both 3. Test "twenty one" to "twenty nine"
Now all the tests from 1 to 22 pass. 23 to 29 can be assumed to work because it is using well tested logic. Test "thirty" to "thirty nine"
Expected the result to be "thirty"
String lengths differ. Expected length=6, but was length=10. Strings differ at index 1. Expected the result to be "thirty one"
String lengths differ. Expected length=10, but was length=6. Strings differ at index 6. Test "forty" to "ninety nine"
Expected the result to be "forty"
String lengths differ. Expected length=5, but was length=10. The necessary code change starts to draw out a pattern. Of course, the pattern could have been quite easily predicted, but since this code is being built by the simplest change only rule, the pattern has to emerge before it can be acted upon. Expected the result to be "one hundred"
String lengths differ. Expected length=11, but was length=6. Test "one hundred and one" to "one hundred and ninety nine"
Expected the result to be "one hundred and one"
String lengths differ. Expected length=19, but was length=10. At this point it should be easy to see that some of the work that has been done previously can be re-used with a small amount of refactoring. First refactor most of the body of the public method into a class called TranslateOneToNinetyNine. Then re-test to ensure that the refactoring process hasn’t introduced any new problems. 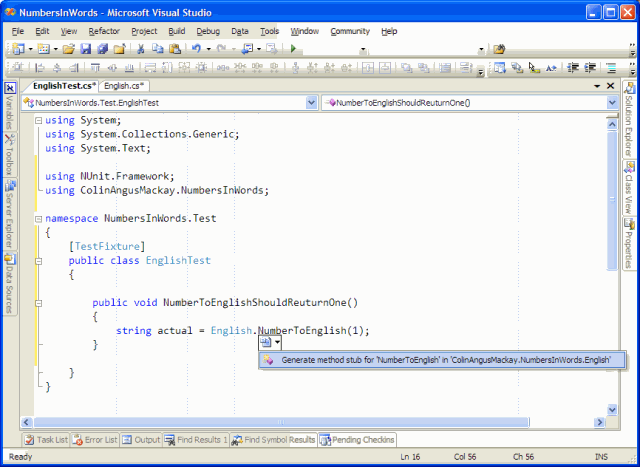 In Visual Studio 2005 it is very easy to highlight some code and extract it into a new method, thus allowing it to be reused by being called from multiple places. For numbers from 101 to 199 the pattern is "one hundred and X" where X is the result of the translation between 1 and 99. Because it would take too long to write all those tests, it is possible to write just the edge cases and one or two samples from the middle of the range. That should give enough confidence to continue onwards. In this case, the tests are for 101, 115, 155 and 199. Expected the result to be "two hundred"
String lengths differ. Expected length=11, but was length=22. Test "two hundred and one" to "two hundred and ninety nine"
Since the next part of the pattern can be seen as very similar to the one hundreds, the two edge cases and a couple of internal cases for the two hundreds are created. Presently, all those tests fail as the method has not been updated to take account of that range of integers. Test "three hundred" to "nine hundred and ninety nine"
From the last change to the method a pattern can be seen to be emerging. The code for dealing with the one hundreds and two hundreds are almost identical. This can be easily changed so that all positive integers between 1 and 999 can be converted into words. Expected the result to be "one thousand"
String lengths differ. Expected length=12, but was length=11. Test "one thousand and one" to "nine thousand nine hundred and ninety nine"
Some forward thinking will reveal that the logic will be similar for the thousands as it was for the hundreds. So, rather than repeat all that in this article, the steps to refactoring the code to work with the range from 101 to 999 can be used similarly with 1001 to 9999. The accompanying download will show all the unit tests. Test "ten thousand" to "nine hundred and ninety nine thousand nine hundred and ninety nine"
In the first set of test, that were expected to fail, for the condition that the integer input was a value greater than 9999 actually shows passing tests. This serendipitous circumstance is caused by the TranslateOneToNineteen method being a compatible match for prefixing the "thousand" for a range up to the 19 thousands. Through this code reuse it is possible to get a full range match all the way up to 999999 with only a change to a part of one line of code. Test "one million" to "nine hundred and ninety nine million nine hundred and ninety nine thousand nine hundred and ninety nine"
At the start the first 20 numbers each had their own test. 100% of inputs had a test. From 20 to 99 it was 20 tests. Only 25% of the inputs had tests. From 100 to 999 there were 18 tests. Just 2% of the inputs had tests. From 1000 to 999999 there were, again, just 18 tests. This represents just 2 thousandths of one percent. The limitations of an integer (Int32) mean that this section reaches the upper limits of 2147483647. Unless an Int64 is used there is no continuation to the trillion range. To this point all positive integers are successfully being translated from an integer into a string of words. At this point, through code reuse, it should be a fairly simple matter to refactor the code to work with negative numbers and zero. Now the test passes. Next is to permit negative numbers. // Special case for int.MinValue. This article demonstrates how to unit test and build a piece of code in small increments. The tests continually prove that the developer is on the right path. As the code is built the constant rerunning of existing tests prove that any new enhancements do not break existing code. If, for any reason, it is later found that the code contains a bug, a test can easily be created that exercises that incorrect code and a fix produced. The full final code is available in the associated download along with a set of NUnit tests. You can download the example code for this article here.